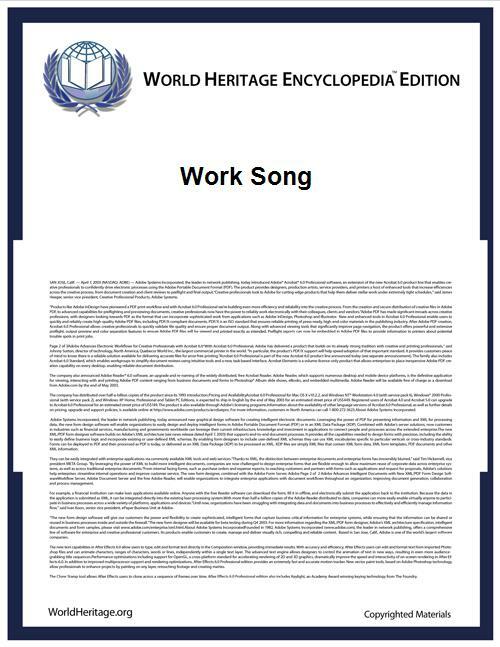 A work song is a piece of music closely connected to a specific form of work, either sung while conducting a task (usually to coordinate timing) or a song linked to a task or trade which might be a connected narrative, description, or protest song. Most agricultural work songs were rhythmic a cappella songs intended to increase productivity while reducing feelings of boredom. Rhythms of work songs, similar to an African drum beat, served to synchronize physical movement in groups, coordinating sowing, hoeing, and harvesting. The usage of verses in work songs were sometimes improvised and sung differently each time. Improvisation provided singers with a subversive form of expression. Slaves sung improvised verses to mock their overseers, express frustrations, and about escaping. Many work songs served to create connection and familiarity between workers. African American work songs originally developed in the era of captivity, between the seventeenth and nineteenth centuries. Because they were part of an almost entirely oral culture they had no fixed form and only began to be recorded as the era of slavery came to an end after 1865. The first collection of African American 'slave songs' was published in 1867 by William Francis Allen, Charles Pickard Ware, Lucy McKim Garrison. Many had their origins in African song traditions, and may have been sung to remind the Africans of home, while others were instituted by the captors to raise morale and keep Africans working in rhythm. They have also been seen as a means of withstanding hardship and expressing anger and frustration through creativity or covert verbal opposition. As a result, industrial folk songs tended to be descriptive of work, circumstances, or political in nature, making them amongst the earliest protest songs and were sung between work shifts or in leisure hours, rather than during work. This pattern can be seen in textile production, mining and eventually steel, shipbuilding, rail working and other industries. As other nations industrialised their folk song underwent a similar process of change, as can be seen for example in France, where Saint-Simon noted the as the rise of 'Chansons Industriale' among cloth workers in the early nineteenth century, and in the USA where industrialisation expanded rapidly after the Civil War. This tendency was even more marked in early American industrial songs, where representative heroes like Pete Seeger and Woody Guthrie in the USA and A. L. Lloyd and Ewan MacColl and Peggy Seeger in Britain. The genre declined in popularity with new forms of music and de-industrialisation in the twentieth century, but has continued to influence performers like Billy Bragg and Bruce Springsteen. ^ a b E. Gioia, Work Songs (Duke University Press, 2006). ^ E. Gioia, Work Songs (Duke University Press, 2006), p. xi. ^ N. Cohen, 'Worksongs: a demonstration of examples', in A. Green, Songs about Work: Essays in Occupational Culture for Richard A. Reuss (Indiana University Press, 1993), pp. 334-5. ^ a b c d e P. M. Peek and K. Yankah, African Folklore: An Encyclopedia (London: Taylor & Francis, 2004), p. 520. ^ M. Dixon, Ride Out the Wilderness: Geography and Identity in Afro-American Literature (Published by University of Illinois Press, 1987), p. 12. ^ S. A. Floyd, The power of Black music: interpreting its history from Africa to the United States (Oxford: Oxford University Press US, 1996), p. 50. ^ D. D. Volo, The Antebellum Period (Greenwood, 2004), p. 278. ^ E. Gioia, Work Songs (Duke University Press, 2006), p. 55. ^ E. Gioia, Work Songs (Duke University Press, 2006), p. 46. ^ a b c V. Bogdanov, C. Woodstra and S. T. Erlewine. All Music Guide to Country: The Definitive Guide to Country Music (Backbeat Books, 2003), p. 901. ^ J. A. Lomax, Cowboy Songs and Other Frontier Ballads (1910, BiblioBazaar, LLC, 2009). ^ a b c d A. L. Lloyd, Folk song in England (London: Lawrence and Wishart, 1967), p. 323-28. ^ E. J. Weber, Peasants into Frenchmen: the modernization of rural France, 1870-1914 (Stanford University Press, 1976), pp. 431-5 and Simon J. Bronner, Folk nation: folklore in the creation of American tradition (Rowman & Littlefield, 2002), p. 142. ^ N. Cohen and D. Cohen, Long Steel Rail: the Railroad in American Folksong (University of Illinois Press, 2000), p. 126. ^ M. Brocken, The British Folk Revival 1944-2002 (Ashgate, Aldershot, 2003), p. 64. ^ M. Willhardt, 'Available rebels and folk authenticities: Michelle Shocked and Billy Bragg' in I. Peddie, ed., The Resisting Muse: Popular Music and Social Protest (Aldershot: Ashgate, 2006), pp. 30-48 and B. K. Garman, A Race of Singers: Whitman's Working-Class Hero from Guthrie to Springsteen (Chapel Hill, NC: University of North Carolina Press, 2000), p. 241.